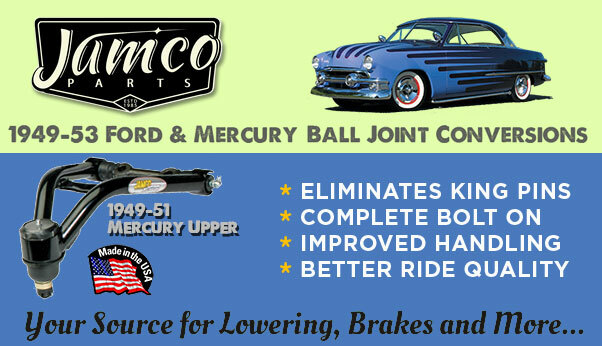 In the mid and late part of the 1930s the industry started to create the first Custom Car accessory parts. Lets take a closer look at an very early Flipper Disk Hubcap. A couple of year ago I was browsing eBay searching for some Custom Hubcap photo for my Single Bar Flipper Hubcap photo archive. I came across an auction that was listed as: 1930’s? Ford Accessory? 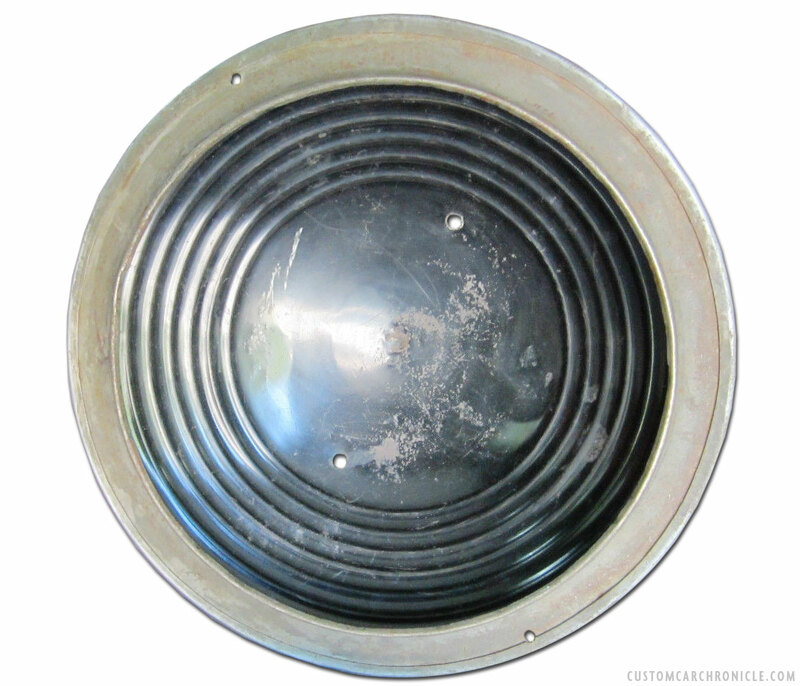 Hollywood Flipper Hubcap Original – Old School. The hubcap that was offered looked very much like some of the ripple disk hubcaps I had seen from some very early dry lake racers, but this one had a flipper added to the center. Which was very much like the Hollywood style Single Bar Flipper Hubcaps we all know so well from the 1940’s customs. I had never seen anything like this flipper before. 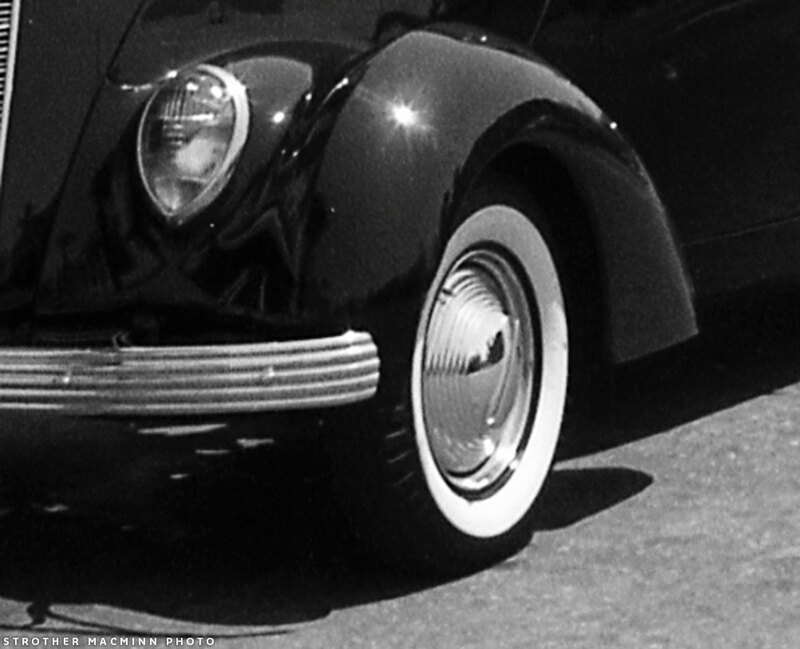 The small diameter smooth section of the hubcap looked a lot like the Cadillac flipper hubcaps from ’34-35, which are shown in an older article I did on the Single Bar Hubcap design. But on the Cadillac unit the smooth hubcap with flipper are separate piece, while on this eBay offering it is all one hubcaps (with the flipper as a separate part). What really intrigued me about the offering is that it mentioned that the hubcap might be a factory accessory. The hubcap eBay listing did not come with much info: Few Dings–Needs some TLC No holes! Measurements are approx. 13 7/8″ across front and back! The last photo shows the hubcap mounted on a sort of beauty ring, and the flipper part has been removed from the hubcap, to show how it was mounted. 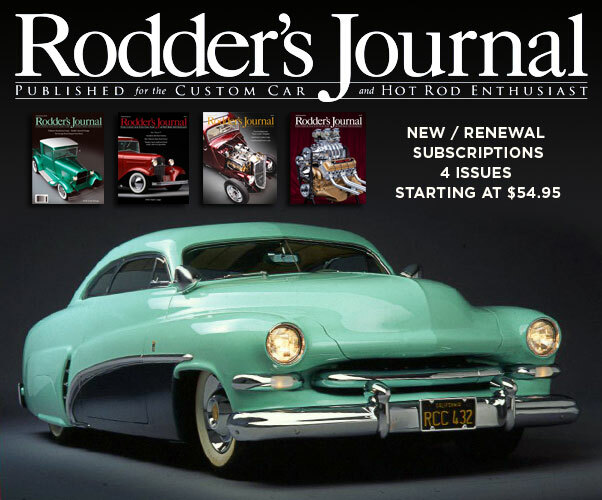 Some time after I had saved the eBay early Flipper Disc Hubcap I came across a photo of an early Customized 1937 Ford convertible sedan in the Rodder’s Journal promotion on the Strother MacMinn book Hot Rods and Custom Cars and this car seemed to have the same hubcaps with the small smooth section and small flipper hubcap. Exactly the same hubcap as the one I had saved from the eBay offering. So now I know that the hubcap was most likely an aftermarket or factory accessory unit, that was available. 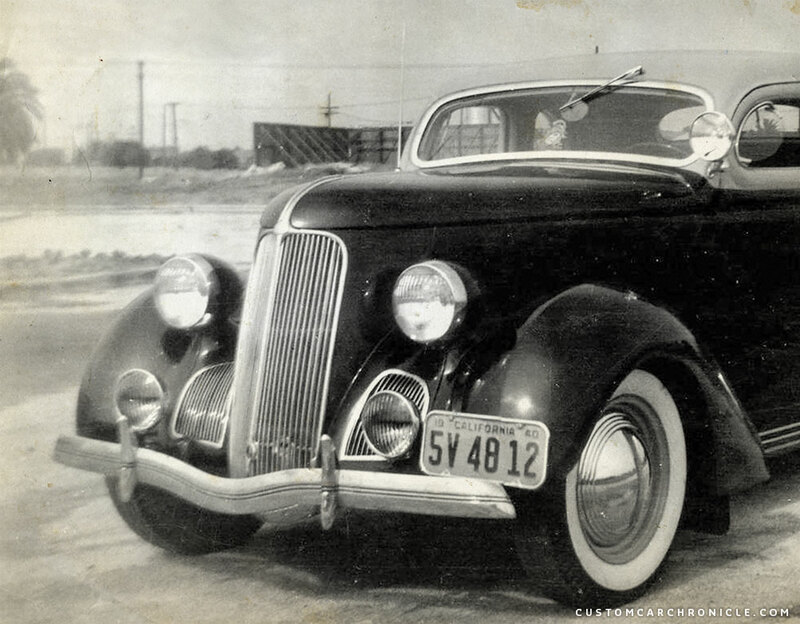 The photo caption in the RJ magazine did not mention a date, but it looks like the license plate is a California 1940 plate. The photo from the Strother MacMinn Collection is not dated, but it looks like the California plate comes from 1940 with larger rounded corners. And that the chrome license plate surround is an older type fitted to the pre 1940 more square cornered plates. The nice chrome plated hubcaps look really good with the multiple ripples and small spinners. It gives the car a very classic look. 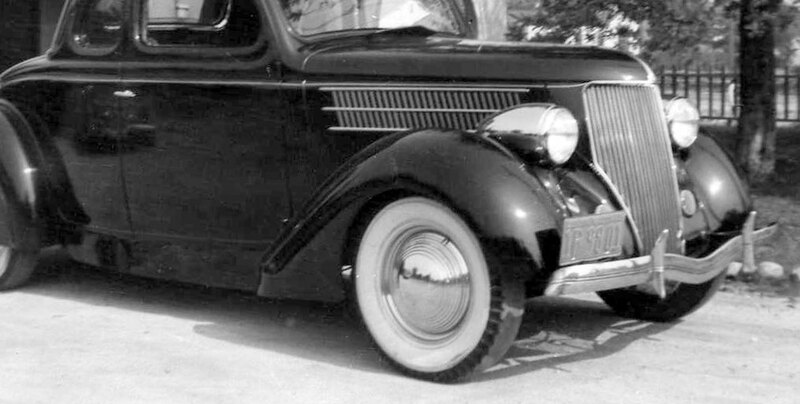 Enlarged section of the photo gives us a good look at the hubcap with the small flipper. 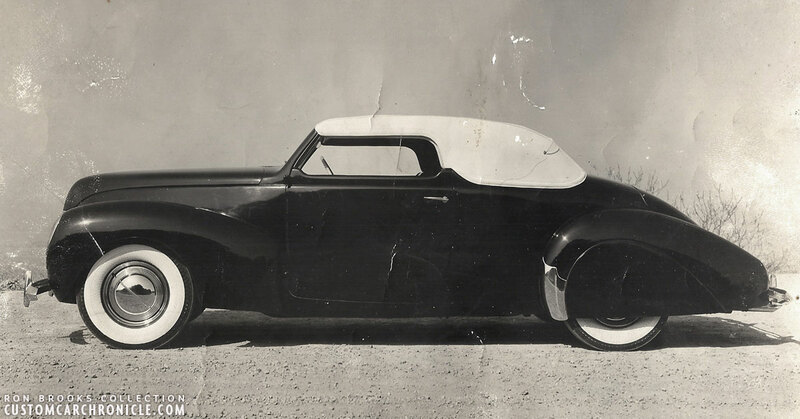 In early 2016 I came across another photo, a really good quality one of the Tommy Lee Speedster that shows the exact same hubcaps on this car. The photo is part of the Revs Institute and scanned at high res, which allows us to have a really good look at the hubcap. 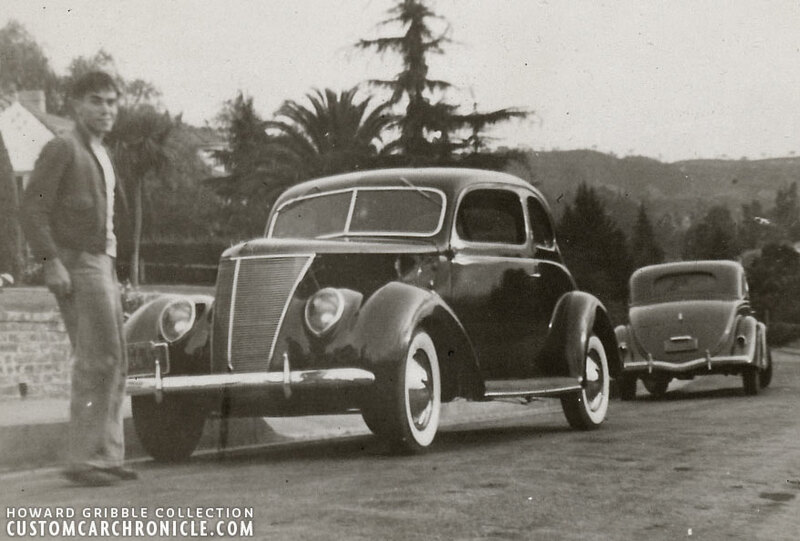 This photo also shows the license plate of this car which is a California 1938 plate. So we now know that the hubcaps are at least from 1938, or perhaps older. 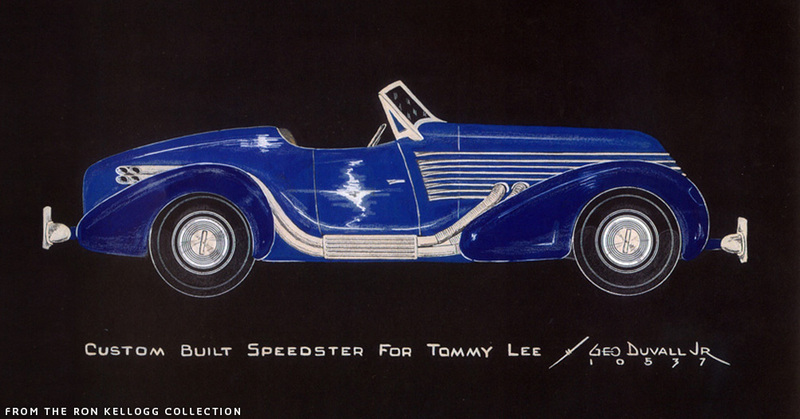 The Tommy Lee Speedster was created by Frank Kurtis in 1937, and the car was designed by George Du Vall. After I found this Revs photo I searched in my online collection and found more photo of the Lee Roadster with these hubcaps. For some reason I had never really noticed them… perhaps especially since the restored car has a set of more regular Single Bar Flipper Hubcaps mounted. Beautiful night time photo taken by Ted Wilson at the Gilmore Stadium in 1938. 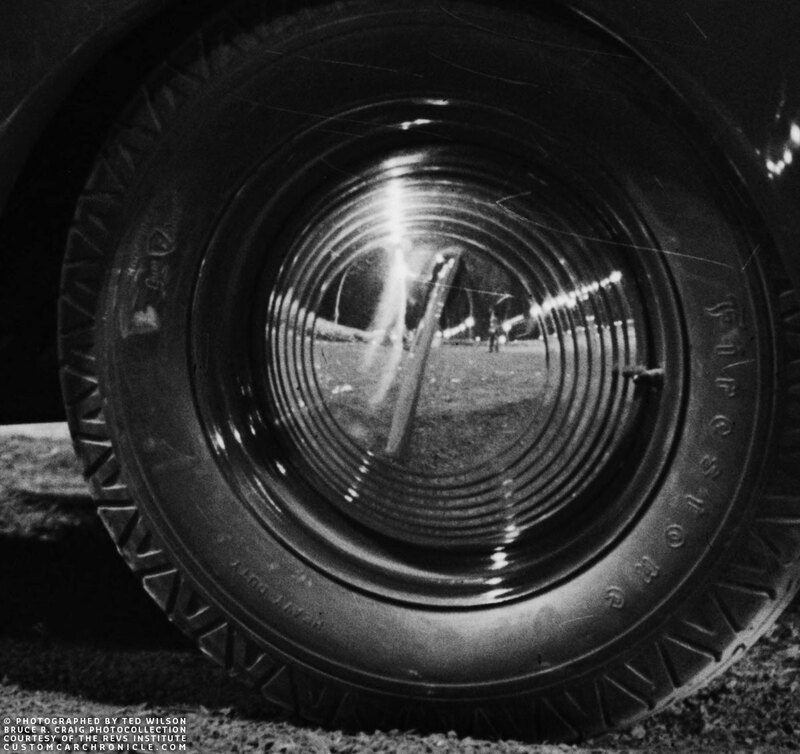 The hubcaps were used on the car without beauty-rings which would become very popular in the next couple of years. And the one on the rear wheels showing a little bit more of the side of the flipper. 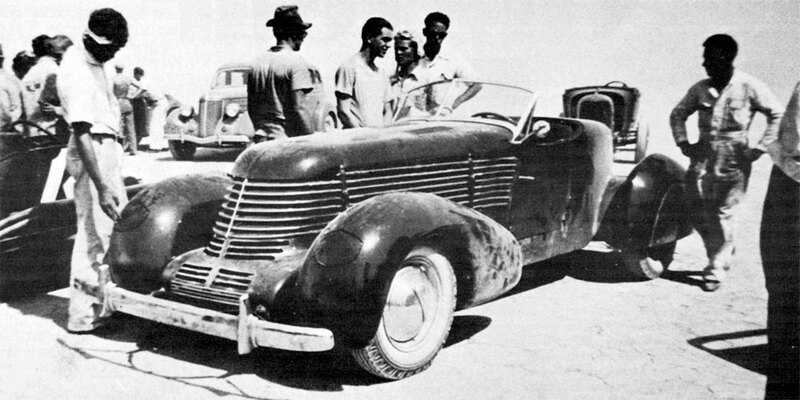 Another photo of the Tommy Lee Speedster with the hubcaps at one of the dry lake races, year unknown. Now I knew that these unique hubcaps were also used on the Tommy Lee Speedster I did a little more research, and remembered a really nice design sketch that George Du Vall. Ron Kellogg had shared this image online some time ago and I had saved it with the rest of my Tommy Lee material. When I looked at it I was shocked to see that the design sketch included the exact design for these ripple disk flipper hubcaps. 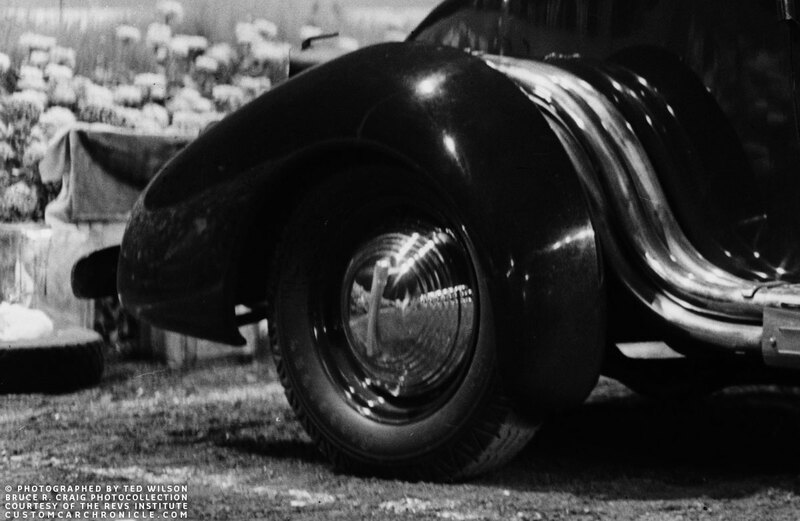 So could it be that George Du Vall had designed these hubcaps, perhaps especially for the Tommy Lee Roadster, or perhaps he had already designed them for another project and they had been in production already? 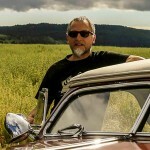 George Du Vall has been credited with the design for several custom hubcaps including the more common ripple disk flipper hubcap, and the Swirl Hubcap. The beautiful side view Sketch George DuVall created for Tommy Lee and Frank Kurtis in 1937 shows the design for the early ripple disk flipper hubcaps. I have not been able to find any proof that the hubcap in this article is an George Du Vall design and product, but it does look very plausible. 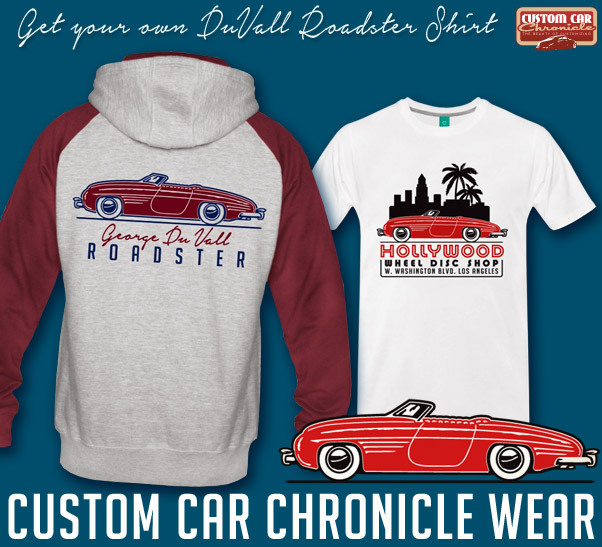 Especially with the exact design on the Tommy Lee Speedster sketch, and the knowledge that Du Valle designed more hubcaps in the 1930’s and 1940’s. Most likely George sold his design and the production drawing to several aftermarket companies who started to produce these hubcaps. In preparation of this article I tried to find as many samples of these hubcaps as I could. But they are very rare. Most likely not to many where produced before the more common larger size 2 or 3 ripple disk single bar flipper hubcaps took over the market. 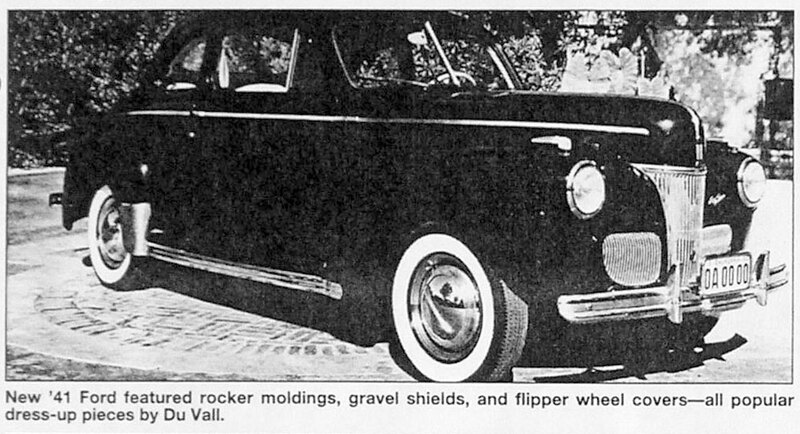 An old article on George Du Vall shows that George Du Vall was also the designer of these hubcaps, which have a larger moon section and flipper. 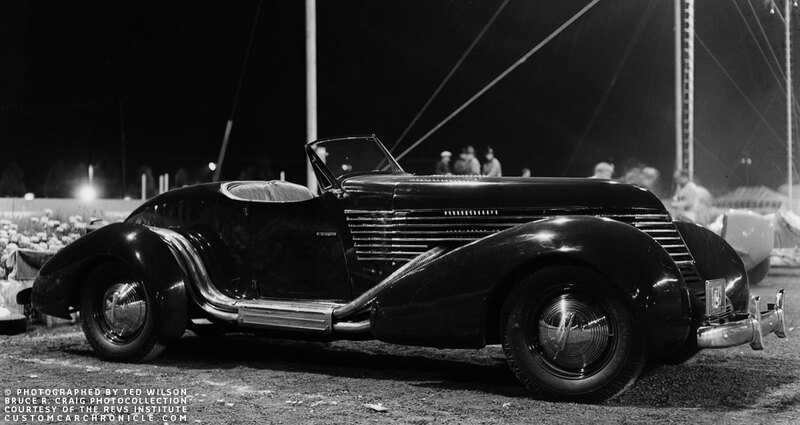 It looks like this is the hubcap that is also used on the ’38 Lincoln at the end of this article. 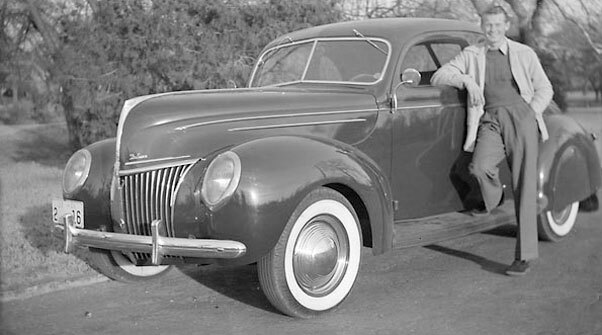 This unusual 1937 Ford ex Sedan Custom also appears to have a set of similar styled hubcaps, but it looks like these are used without the flipper. 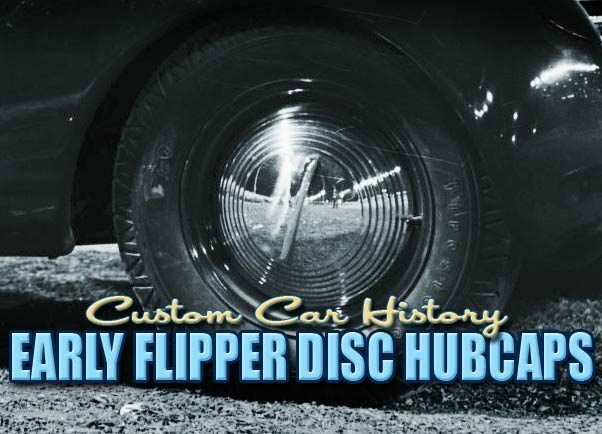 We know that the later version of the Ripple Disk hubcap was also available without the flipper, so perhaps this was the case with this early unit as well. Most likely this photo was taken around 39 (square corner CA plates with World Fair text on the top). 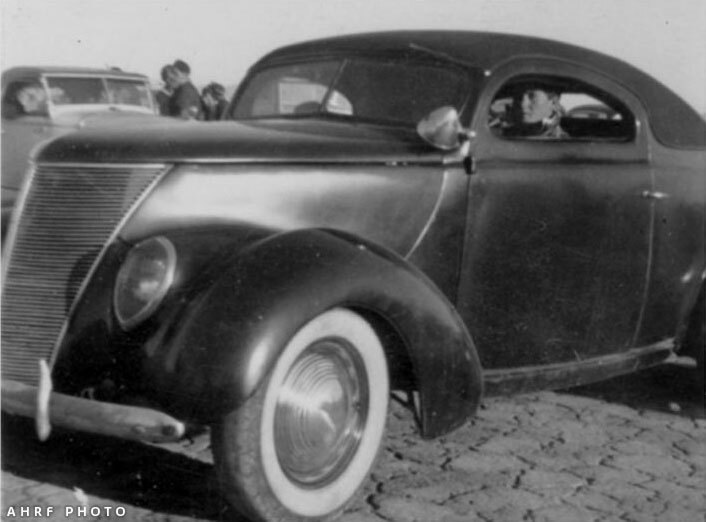 The ’36 Ford 5-window coupe has its running boards removed, fender ends reshaped, a set of beautiful torpedo shaped chrome headlights and a set of what looks like a none flipper version of this hubcap. Also interesting in this photo is the pin-striping along the belt-line, one of the earliest, if not the earliest I have seen on a Custom. And another set of the hubcaps with-out the flipper on this 1939 Ford Coupe. Unsure about which state this car comes, I cannot read the plate. Also notice the double sided white wall tires. 1934 Ford chopped Cope from the AHRF shows a similar, non flipper ripple disc hubcap. 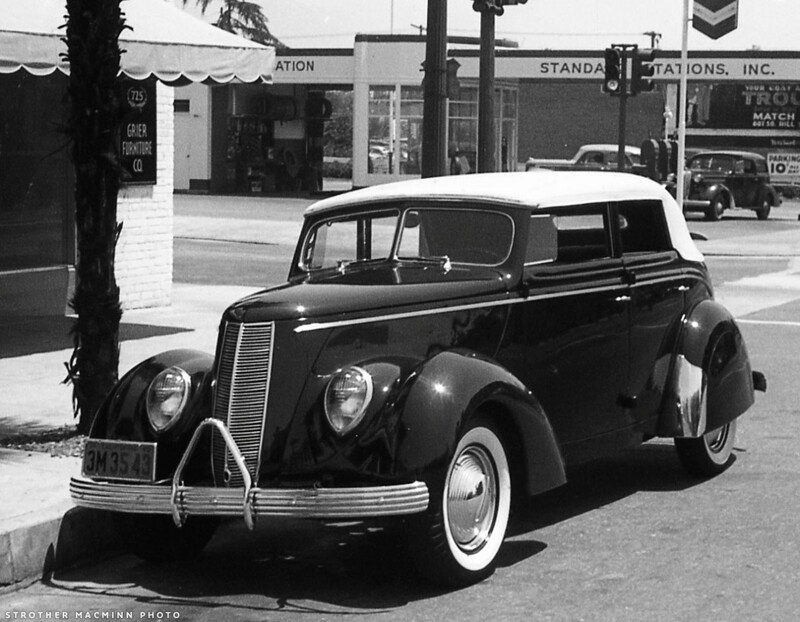 Notice that the ’34 was nicely Custom Restyled with matching ripple ’37 DeSoto bumpers and a set in license plate. 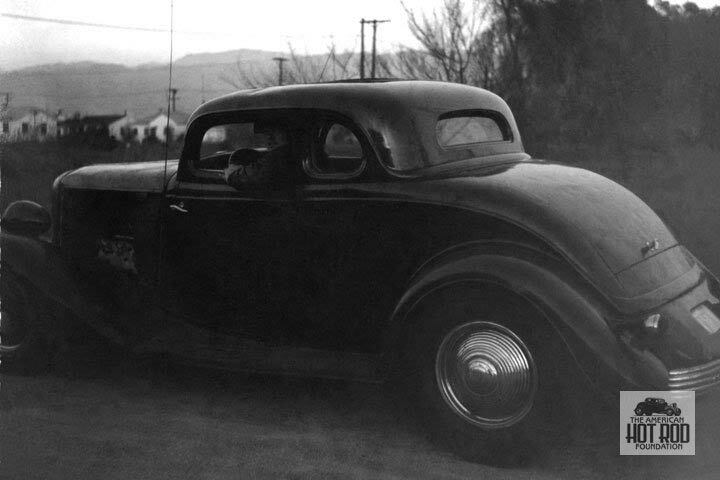 From the Howard Gribble collection comes this ’37 Ford that appears to have the same hubcaps as well. Perhaps these are an in-between version of the original hubcap in this article, and the more common wider hubcap that was “mass” produced. A Single Bar flipper box label I came across online many years ago. Not sure if this is a box for the hubcap in this article, or a later version with a larger moon section. I have not seen many of these boxes. 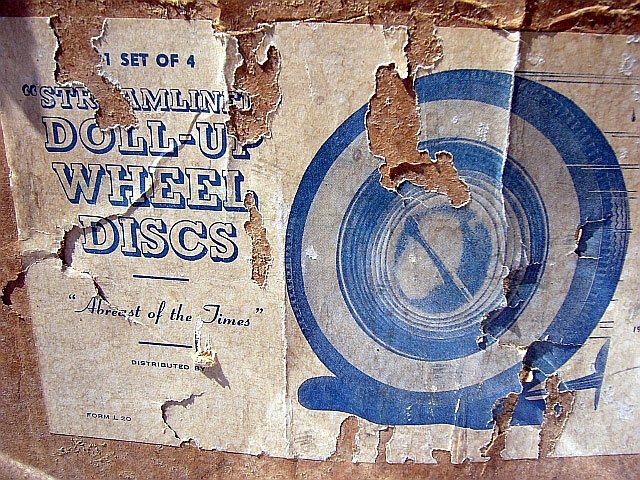 “Streamlined” Doll-Up Wheel Discs. This beautiful restyled 1938 Lincoln was built before WWII and uses also a smaller size Flipper disc hubcap. But this one is clearly an in-between the hubcaps from this article, and the more common 2-3 ripple disk hubcaps from the 1940′. 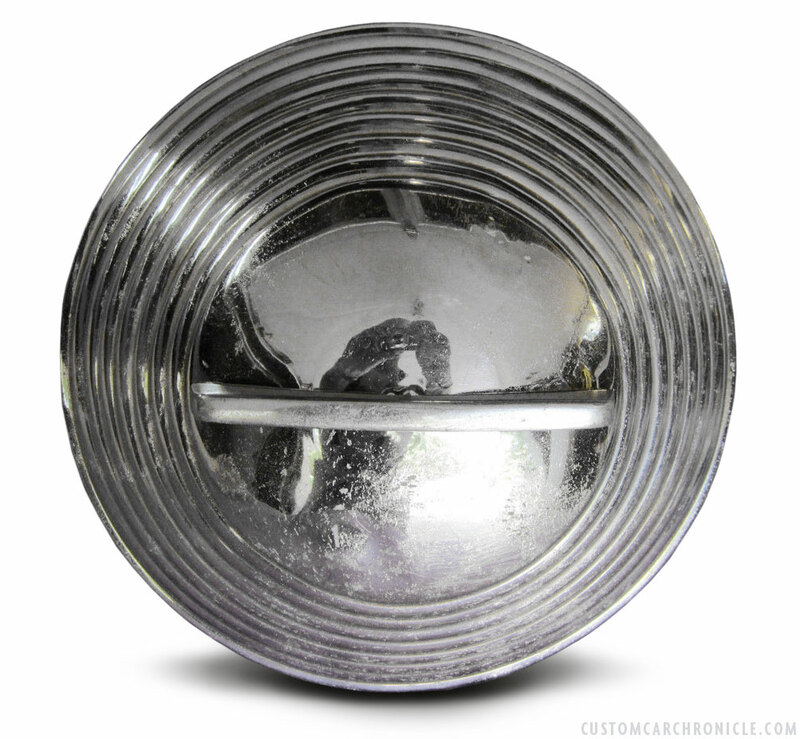 Just including this photo to show the most popular version of the single bar flipper hubcap. And how it was already available in 1940. This particular one has three ribs, but there were also version with two, and even one rib. In the beginning of the article I mentioned that the eBay auction listed this Single Bar Flipper Hubcap as a possible Factory Accessory part. I was very intrigued by that, since I had heard one time before about a single bar flipper hubcap as a factory accessory, but I’m still unsure about this, and so far I have not been able to find any information about this. It could of course be possible that FoMoCo had bought the designs from George Du Vall for these hubcaps… but at this moment I think they were aftermarket products, perhaps they were available from the FoMoCo car dealers. I hope one day to find out more about this. 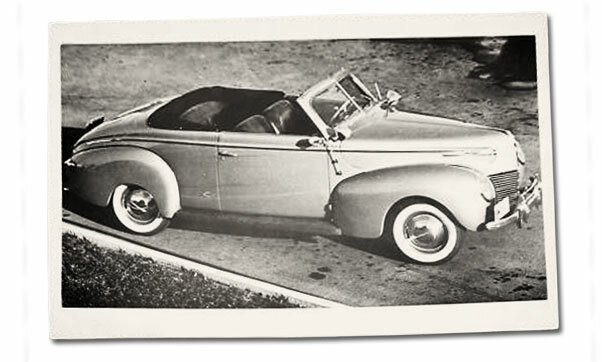 Here is an photo of an dressed up 1939 Mercury that was listed as an factory or dealer photo with factory accessory parts, antenna’s, spotlights, bumper over-riders and flipper hubcaps. Anybody knows anything more about this? I don’t know for sure about that Merc convertible but it is possible that the items listed on it were what we used to call “Dealer add-on’s.” Items that some of the dealerships choose to carry and that you purchased directly from the dealership and had them installed on your car for more money. Dealers used to do this to make more profit on the car sales and the money from the add on’s went directly into the dealerships pocket. Most of the there items were purchased from an aftermarket distributor and not the automotive manufacturer. Some of the old wooden boat companies allowed their dealers to do this as well which is why you could see two exact same models of a boat that had different accessories on them. That makes so much more sense Torchie.